Encore Boston Harbor and the Chelsea Collaborative started the first of many monthly job fairs last Thursday, Aug. 2, at the Collaborative’s Broadway headquarters. The Collaborative’s Sylvia Ramirez said they want to make sure Chelsea residents can benefit from the 4,000 full-time casino jobs that are coming in June 2019, and time is of the essence. She said Encore will begin coming to the Collaborative to discuss and assist potential applicants with the process. The first such meeting came last Thursday, and Ramirez said the next one will be Aug. 30. Ramirez said the casino is going to affect Chelsea as much as it will Everett and Charlestown, and with that in mind, she said residents should be ready for the jobs that will be coming very soon. She also said Chelsea is falling behind, and now is the time to get ahold of the opportunities. By bringing in representatives from Encore once a month, Ramirez said it ensures that the company will commit to Chelsea. The city does have preference in line with Boston and Cambridge. Only Everett and Malden come ahead of Chelsea. Representatives from Encore will be able to help residents one-on-one in English and Spanish. They will be able to define the jobs that are available and what one needs to do to qualify for those jobs. Likewise, they will be discussing the new “dealer school” that is about to start at Cambridge College in Charlestown. The six-week course will begin in the fall, with applications coming soon. Meanwhile, Ramirez said the casino jobs Ð whether in the gaming area or in non-gaming functions Ð can provide a better income to help solve the rising housing costs in the city. If Bellingham Square is going to be fully returned to the community, then let that return be led by dominoes. 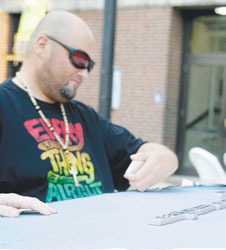 Roberto ‘Tito’ Rodriguez checks his dominoes during Game Night on Tuesday, July 31, in Bellingham Square. Game Night is slowly gaining popularity, and the City initiative takes place every Tuesday from 6-8 p.m. It was slow going at first for the introduction of an outdoor Game Night on Bellingham Square – which is sponsored by the City’s Chelsea Prospers initiative. A few would trickle in and out, but the hard-scrabble Square had gained a reputation that many Chelsea residents hadn’t yet forgotten. But now with about a month under the belt, momentum for the simple fun in the Square has begun to form with about 10 or so regulars – and that momentum has everything to do with something as simple as a domino. As the group enjoys their game, salsa music plays in the background and many observers pass by – seemingly wanting to join in, but not entirely certain why people are playing games in Bellingham Square. But certainly it was, and Rohena and others who participate in Game Night found a peacefulness in the Square on a sunny, warm summer night that hasn’t existed there for a long time. Rodriguez has even brought in some converts like Jen Matheson, who is new to downtown Chelsea and was taught how to play dominoes. Now she’s a regular. Rivera said she has hoped for community building events like a Game Night for a long time because it promotes stability and familiarity. Without that, there is no community, she said, and that makes the people vulnerable. “If we don’t get back to being a community, it makes it even easier for another community to replace us without us knowing,” she said. There is no end date in sight for the Game Night, and organizer Mimi Graney said they will likely go until it gets too cold. For now, the goal is not to get the ‘Chiva’ – which is Spanish for ‘female goat’ and is slang for getting no points in a game of dominoes. But for the future, the goal is to have several more tables full of people from the community functioning normally and having fun together. Certainly in Chelsea, if anything, a domino game is good first step. William Molino celebrates a win in a game of dominoes during the Chelsea Prospers Game Night on Tuesday. Watching him enviously are Raul Melendez, Alex Garcia and Mike Vega. The City of Chelsea will begin a downtown façade and signage improvement program in a kick-off meeting on July 12.
Business and property owners in the downtown, as well as other interested parties, are invited to this meeting to learn about the rollout of the program and to meet Nathalia Hermida. Hermida will be available throughout the summer to provide free design services for signage and façade improvements of downtown properties. During this meeting, Hermida will detail the design process, what assistance she’ll be able to provide and how to engage her services. Along with responding to inquiries solicited through this meeting, Hermida will also be approaching specific identified properties. Those interested in the program who cannot attend this meeting should contact Mimi Graney, Downtown Coordinator at mgraney@chelseama.gov. Design consultation with Hermida will be available both in English and in Spanish. The City of Chelsea Façade and Signage Program meeting will take place on Thursday, July 12, at 8:30 a.m. at Chelsea City Hall, third-floor Committee Room. City officials and consultants for the Re-Imagining Broadway effort will take one of their most controversial suggestions to the business community on Broadway today, Aug. 31, prompting a discussion about making Broadway a two-way street. The six-month planning effort has come up with numerous suggestions about how to improve the corridor, but at the top of those suggestions is the idea about taking Broadway from a one-way to a two-way. The street has been in its current configuration for more than a generation, and few remember the last time it was moving differently. However, count City Manager Tom Ambrosino as a convert to the idea. Ambrosino said this month that after the meeting with the downtown stakeholders, including the businesses, they would come up with a decision on the matter. All downtown business owners and employees are invited to attend the meeting, which takes place at 9 a.m. at the Greenhouse Apartments Community Room, 154 Pearl St.
A Spanish language interpreter will be available. Elsy Sanchez, 17, is one of 11 Chelsea High students to be awarded the new Seal of Bi-Literacy this year during graduation. Eleven new Chelsea High School (CHS) graduates will carry at least one more award with them this year than did other classes at CHS, and that award is the newly piloted Seal of Bi-Literacy that Chelsea and several other districts are implementing. Sarah Warren of Chelsea Public Schools said Supt. Mary Bourque and the administration was looking for a way to recognize students who had strong bi-literacy skills. In Chelsea, because so many students are fluent in Spanish and English, the designation was meaning and was a way to market this unique skill to colleges and employers. The Awards were given out at the annual Chelsea High Awards Night on Monday, June 5. Bourque said she was very excited to be able to premiere the new award to 11 students in the class. She said they will move forward with it in the future as well. Warren said there are three levels for the Chelsea seal. Platinum winners achieve a 5 on their Advanced Placement Spanish Test and an advanced on their MCAS English Language Arts (ELA) test. A gold winner scores a proficient on their MCAS test and a 5 on their AP Spanish. A silver winner scores a proficient on their MCAS test and a 3 or 4 on their AP Spanish. 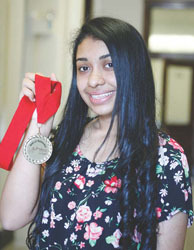 Elsy Sanchez, 17, was one of the first Gold Seal winners, and came to that point after starting out her high school experience in the English Language Learner (ELL) program. Sanchez was born in Chelsea and attended the Sokolowski School and the Clark Avenue Middle School. However, after fifth grade, tired of going back and forth to Honduras where her parents had moved – having left Chelsea behind – she decided to stay in Honduras. However, after being in Honduras for some time, Sanchez realized that she had some pretty big goals for her future. She decided that getting to an American university from Honduras was going to be very tough, but getting there from Chelsea was more likely a successful path. Sanchez entered the ELL program, known as the Bridge Academy at CHS. There, her teachers saw she was talented and had big goals and just needed a push. With that support upon moving back, Sanchez was able to move to the regular Chelsea High program by her sophomore year, regaining her English fluency again. In her senior year, Sanchez has put her English headaches behind her and took six Advanced Placement classes, including Physics, Stats and Language. She said she plans to go to Salem State in the fall to study biology and Spanish, with the goal of becoming a pediatrician. As for the seal, she said it has the potential to open doors not only for school, but also in the workplace. Actor Brooks Reeves (center) will play ‘Hamlet’ in Apollinaire’s Theatre in the Park production this month, which kicked off last night, July 13, at the PORT Park. The unique production has Hamlet giving his famous speech on top of one of the salt piles. ets put in place for the production. Brooks Reeves, 33, who is playing Hamlet, looked around at the surreal surroundings, heard a fog horn in the distance and said, “This is going to be very interesting,” he recalled. ‘Hamlet’ by Apollinaire premeired for this summer’s run in the PORT Park on Marginal Street Wednesday night, July 13, and will continue until July 31 from Wednesdays to Sundays at 8 p.m. and is free thanks to generous donors and supporters of Apollinaire. Those interested in taking in the interactive, moving production are invited to bring a blanket and walking shoes – as there are 10 different locations within the Park that the audience will have to travel to. Jacques said it is notable because for the first time in more than a decade, they’ll be presenting a Shakespearean play – and on the Bard’s 300th birthday to boot. Reeves, who is now in his fifth show with Apollinaire and his 21st show in Greater Boston since moving here from Wyoming, said the moving sets are quite interesting in the outdoor setting. Jacques said that those watching will have to move, and that’s part of the program with many Apollinaire productions and has been a hallmark of their outdoor shows the last 13 years. Even so, she said anyone who needs a wheelchair or walker will be able to get one from the crew. Those items will be on hand to borrow. This is Apollinaire Theatre Company’s 13th year of offering free bilingual productions in English and Spanish. In anticipation of the fall opening of its new youth theater, this summer our Chelsea Youth Theatre students will present the Spanish production on July 30 and 31 at 6 p.m. Audience members are encouraged to bring blankets and beach chairs, and a picnic to enjoy along with the harbor views.